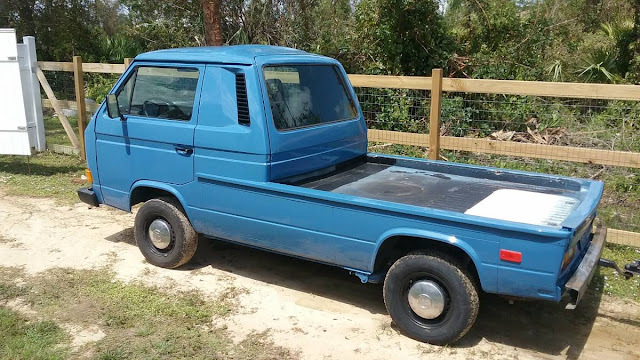 Volkswagen built a utility/pickup version of their iconic Type 2 (T3) Vanagon with a strange hinge-sided bed that is impractically high and strange looking to boot. 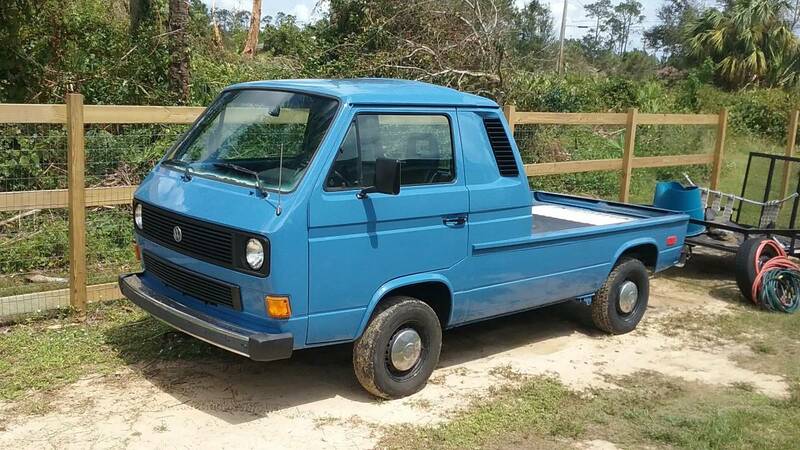 But this next car is an example of what a blow torch wielding customizer can build that is probably better than the factory and certainly cheaper.. Find this 1984 Volkswagen Vanagon offered for $4,800 in Lehigh, FL via craigslist. Tip from Dascpcu. That's a cool concept,but doesn't appear to be a very practical one. Without significant sides to that bed, you aren't going to be able to carry much of anything back there. Maybe palletize every load, but then you need tie-down anchors. I wanna like it, but not as it is. And the price certainly seems fair, too. It would be easy to attach sides using that lip that seems to go all the way around the bed. The interior looks amazing that rear shelf is the perfect size. Or you could run tie downs under the lip to hold the cargo in place. They took away the fresh air vents to the engine compartment. I wonder how hot it runs now. Granted it is a wasserboxer. I like the concept, but the plastic engine cover needs some minor uprating. Looks like the rear hatch still opens, though, which is nifty. Don't know for what, but you're set.